Discover the power of recovery ministry for your church. Churchgoers who experience painful family issues, addictions, abuse, loss, mental illnesses, and other secret sorrows begin to believe they live beyond the grip of God's redemptive hand. Pastors often feel ill equipped to help with such problems and refer people to resources outside the church. People badly need Christ-centered counsel and encouragement, but few church leaders even know where to start. 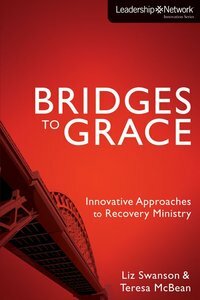 Bridges to Grace is an inspiring introduction highlighting the stories of churches across the country that are thinking systematically and organizationally about the ministry of recovery. The authors share how this ministry is bringing God's grace to hurting individuals. They relate both success and failure, and best of all, they demonstrate how God uses recovery ministry powerfully for his kingdom purposes. About "Bridges to Grace (Leadership Network Innovation Series)"
Liz Swanson joined the staff of Leadership Network in 2005, serving as Leadership Community Director for Recovery Ministries. She is a conference speaker for university groups, church groups and women's groups. Liz also has an extensive background in ministry, having worked for Campus Crusade for Christ for over 20 years. She is a skilled communicator, holding an MA in Human Communication and has taught in the Communications Department at Colorado State University. She and her husband, Eric, now live in Colorado. What is the rapidly expanding multi-site church movement all about? Experience the revolution for yourself and see why it has become the "new normal" for growing churches. A Multi-Site Church Roadtrip takes pastors, church leaders, and anyone who is interested on a tour of multi-site churches across America to see how those churches are handling the opportunities and challenges raised by this dynamic organizational model. Travel with tour guides Geoff Surratt, Greg Ligon, and Warren Bird, authors of The Multi-Site Church Revolution, and enjoy engaging and humorous on-site narratives that show you the creative ways churches of all kinds are expanding their impact through multiple locations. Hear the inside stories and learn about the latest developments. Find out firsthand how the churches in this book are broadening their options for evangelism, service, and outreach - while making better use of their ministry funds. Since each church on this tour is unique, you won't find a cookie-cutter approach to ministry. Instead, you'll gain some practical tools you can use to explore a multi-site direction at your own church.